The Pedro Arrupe Volunteers are hosting a series of service projects throughout the month of March! Sign up below for these great opportunities! In the season of Lent, we offer many additional opportunities for the sacrament of Reconciliation. Throughout the day on Monday, March 5th we will have various events taking place. All are welcome! Service of the Word with Fr. Koterski, S.J. Join Fr. 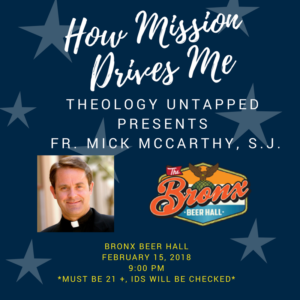 Mick McCarthy, Vice President of Mission Integration and Planning, February 15 at 9:00 p.m. at the Bronx Beer Hall to hear more about how the Fordham Mission drives him in his everyday life! All students 21+ welcome. 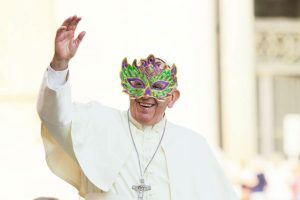 Join us TODAY for our annual New Orleans Style MARDI GRAS party!! Celebrate with lots of yummy food, great music, and wonderful friends as we enter into the Lenten Season. The fun begins at 5:00 PM in the Ignatius Loyola Room! We hope to see you there! !